Our researchers, at TheTechnicalTraders.com, believe the $65.00 level will act as resistance to this current upswing. 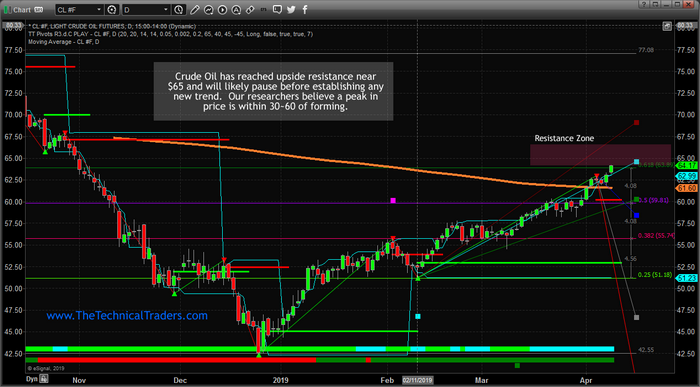 We believe the upside price move may continue to levels near $67.50 before weakening and beginning a topping formation. We believe our expectation that precious metals will bottom near April 21~24 is key to understanding the dynamics of this move in Oil. As long as FEAR does not enter the market, then Oil will likely react to impulse factors exclusively related to Oil. Once Gold breaks out above $1500 per ounce, our belief is that Oil will react to fear factors related to some broader economic event driving investors into precious metals. We’ve recently launched a new technology solution for our members that delivers our incredible research and trading solutions. You can also visit TheTechnicalTraders.com to learn more about our research team and past article. 20129 is going to continue to be an incredible year for skilled traders – you won’t want to miss these big moves that are setting up.